Turkey’s main opposition party is preparing to formally appeal for the annulment of a referendum to expand President Recep Tayyip Erdogan’s powers, while the country’s prime minister has called for the official results of the disputed vote to be respected. The secularist People’s Republican Party (CHP) says its deputy chairman, Bulent Tezcan, would present the appeal to Turkey’s High Electoral Board (YSK) later on April 18. The challenge comes amid concerns raised by opposition parties and international vote monitors about major voting irregularities in the April 16 referendum. Proposed changes that will give the president more power and could enable Erdogan to stay in office until 2029 passed with 51.4 percent of the vote, according to electoral officials. Erdogan’s critics say the reforms will hand extensive power to a man with an increasingly autocratic bent and leave few democratic checks and balances in place. “Everyone should respect the outcome, especially the main opposition,” he added. 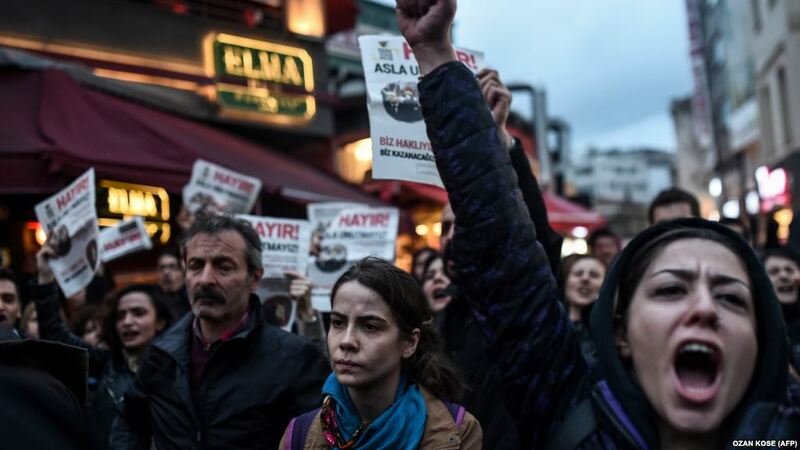 Thousands of people took to the streets of Istanbul and other Turkish cities late on April 17 to protest the results of the referendum. The protesters expressed anger about last-minute changes to the referendum voting procedures and an electoral board decision to allow as valid more than a million ballots cast without an official stamp. The decision by the YSK to allow unstamped ballots was clearly against the law, prevented proper records being kept, and may have impacted the results, according to the Union of Turkish Bar Associations (TBB). The bar association expects Turkey’s electoral body to realize its constitutional responsibilities in evaluating complaints, a statement said. Erdogan rejected criticism, saying Turkey does not “see, hear, or acknowledge the politically motivated reports” of the monitors. Addressing supporters in Ankara, Erdogan said the country could hold a referendum on its long-stalled EU membership bid. He added that he would approve reinstating the death penalty if it was supported in a referendum or a bill was submitted through parliament, a move that would end Turkey’s EU negotiations. In a separate development, Turkey’s council of ministers moved to extend for another three months a state of emergency declared in the wake of a failed July 2016 coup. The extension first must go to parliament for approval.